Did you know that it took Erno Rubik, the creator of the Rubik’s Cube, more than one month to solve its own creation? In fact, we was not even sure if there was a method to solve it. But for me, it was a code I myself had invented! Yet I could not read it. It may seem surprising, but keep in mind that this website did not exist, hehe. Seriously, you have to put yourself in his shoes. Once he creates the Cube, he spends every day trying to solve it. No one had ever solved it. In fact, no one had attempted to solve it. Day after day, without achieving any progress most the days, must be exhausting. Is like when you decide to go home after a nice walk in which you have seen many lovely sights. I decided it was time to go home, let us put the cubes back in order. And it was at that moment that I came face to face with the Big Challenge: What is the way home? 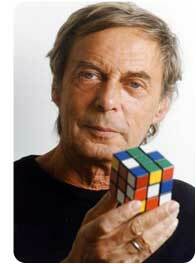 If you want to learn more about his life, I recommend you to read this Erno Rubik’s Biography. Don't be selfish! Share it!